For a fragrant, eye-pleasing shrub to add to your home garden, the mock orange plant (Philadelphus coronarius) is a care-free shrub that will give years of enjoyment while requiring little care. More commonly called a sweet mock orange shrub, it has orange-scented small white flowers that bloom prolifically in late spring through early summer against a backdrop of dark, glossy green foliage. This deciduous shrub is hardy in UDA zones 4 to 8 and will grow from 4 to 10 feet tall depending on the variety and growing conditions. For sweet whiffs of citrus scent, plant the mock orange shrub near a patio or window. Grow a sweet mock orange shrub in a location that receives full sun all day with some partial afternoon shade. The shrub will bloom and grow better in full sun and maybe become leggy if given too much shade. Grow in well-draining soil that has organic matter added before planting. The sweet mock orange plant can tolerate a wide range of soil pH from 6.1 to 8.5. Water well to get the plant established, every other day or so, just to keep the soil moist. After about two months, cut back to watering every two weeks. Use one bucket full of water for each watering. Sweet mock orange shrubs are drought tolerant so do not need excessive watering. Fertilize one month after planting using an all purpose fertilizer such as, 10-10-10. Apply at the drip line of the shrub, under the outermost branches and water in well after applying. 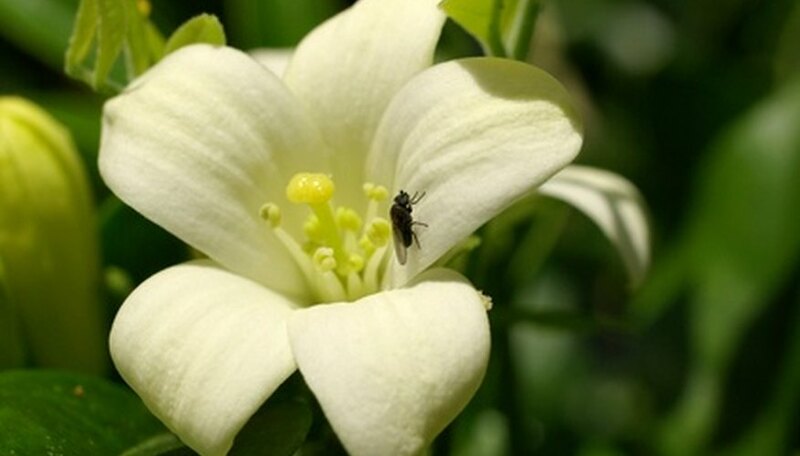 Typically a sweet mock orange shrub does not need fertilizer more than once a year in the early spring, but if it begins to show signs of nutritional deficiency, such as yellowing leaves and slowed growth, then it may be necessary to fertilizer again. Prune the sweet mock orange shrub to keep shaped, but limit how much you trim, and pruning should not be done until the second year of growth. In early spring, cut out any dead branches and faded flowers, then cut back one-third of the remaining branches. Do not apply fertilizer after late summer. Do not prune in late summer or early fall.